A new post on the 2nd day of the year. Yaay, I made it. Hope you all have enjoyed the holiday season with your loved ones and energized yourself enough to start fresh for this year. I promised myself to blog more this year, hope I can keep it for the whole year. My first post would be a seasonal favorite of my family. As winter is here in full swing, we're getting beetroot abundantly. My kids don't love beets if I make a sabji with it. But they love it if I make parathas with them or make halwa(sweets) with it. Have you made beetroot halwa yet? It really tasty. Just make similarly as you make gajar ka Halwa(carrot Halwa). I make in micowave in just 20 minutes, you can follow this recipe. White Oil : 1 tsp. For the stuffing : Grate the beetroot very fine. Heat oil in a pan, add grated beetroot, it will leave some moisture, Keep stirring till all water evaporates, then add ginger paste, turmeric, roasted cumin and chilli powder one by one and keep mixing with beets. Season with salt. Add sugar. Keep stirring and mixing till the mixture dries up and leaves the side of the spoon. Remove from heat and keep stirring. Let it cool. Making the dough : Take flour in a wide bowl, add oil and salt and mix well without adding water. Then adding little water at a time, make a soft and pilable dough. Make medium sized round ball out of the dough and keep aside. Making the parathas : On a plain surface, sprinkle some flour, keep one ball of dough and slowly pressing on it, make a small round. Place 1 tblsp. of stuffing in the center of the round you made,sprinkle little flour over the stuffing(this helps in rolling the parathas and prevents it from breaking while you roll further). Now gather all the sides and make a ball again. Tips :: the quantity of stuffing depends on the size of the dough ball you make. Do not put much stuffing. Frying the parathas : Heat a tawa, place a rolled out paratha on the tawa, let it cook a little from both sides without adding oil/ghee, then brush oil/ghee on both sides and fry till they are golden brown. 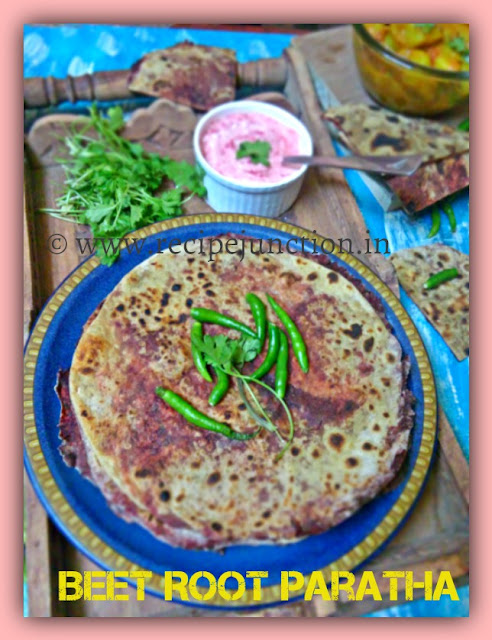 Tips :: Fry the parathas in medium heat, otherwise parathas will turn hard. 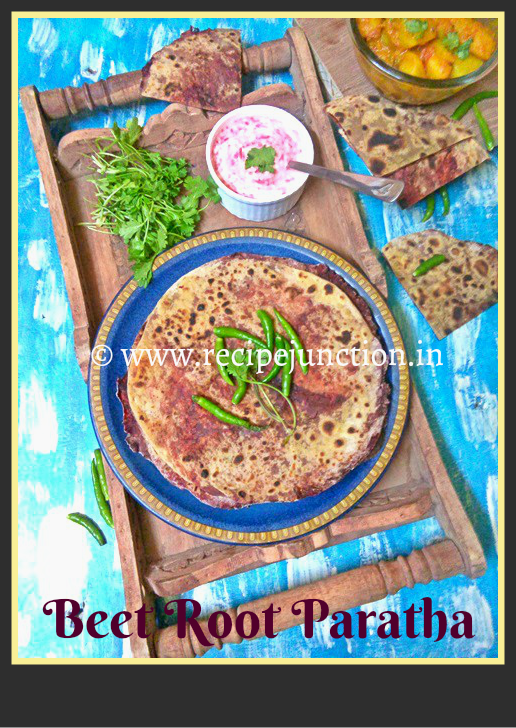 Fry the other parathas similarly and serve hot with some Alur Dom and beetroot raita. 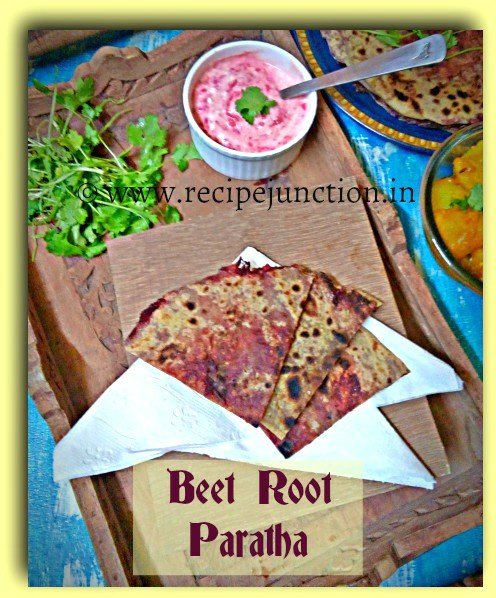 You can make Beetroot Chapati too, follow this recipe.